*Tutor:* Are you looking for a few refresher classes or some tutoring throughout the school year or during school breaks? Alassane is available to tutor French, Math, Economics and Biological Sciences at all levels. His past experience includes tutoring students from the International School of Dakar (ISD), the West African College of the Atlantic (WACA) among others. He is experienced, patient, currently available and is highly recommended. Feel free to contact him directly by phone at: 78 376 0436 or at 7841770 23 and by email at mballoas08@gmail.com. Or contact sanwogouk@gmail.com for a recommendation. Swimming Pool: Monday-Friday from 10:00 am to 17:00; 10,000 cfa for adults and 6,000 cfa for children. 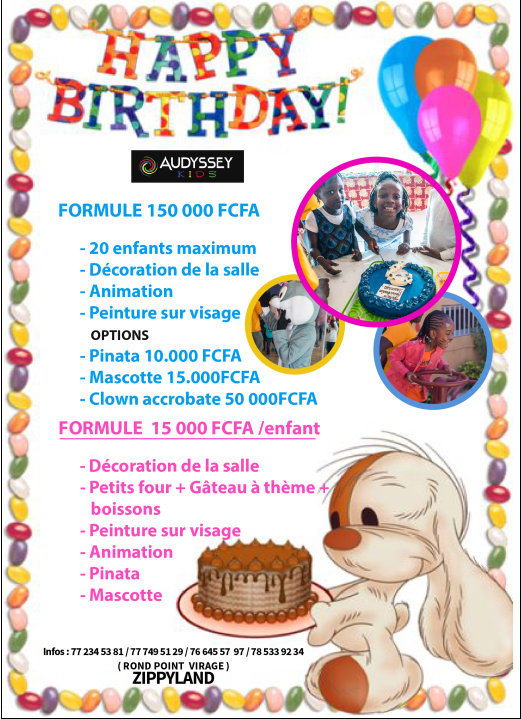 Sundays and Holidays: 28,000 cfa including a buffet lunch (adults); 14,000 cfa children. Sundays and Holidays after 15:00 12,000 cfa for adults, and 8,000cfa for children. Tennis: Monday – Sunday: 12,000 cfa /hour (Closed Fridays). To practice with the tennis instructor it is an additional 7,000 cfa/hour. If you invite a guest it is another 5,000 cfa per hour. Membership : 50,000 cfa /month or 112,500 cfa for three months. Golf: Monday-Friday from 08:00 to 18:00 (9 hole golf course) 15,000 cfa per person. Weekends and Holidays: 20,000 cfa per person. Membership one year: 725,600 cfa, plus 50,000 cfa entrance fee and 20,000 cfa for the license. Happy Kids School, première école plurilingue de Dakar (français, anglais et initiation au chinois) fait peau neuve : Nouveaux programmes d’enseignements, Nouvelles méthodes pédagogiques ainsi qu’une amélioration de l’aménagement de nos locaux. De ce fait, nous vous proposons une journée porte ouverte le samedi 24 Juin 2017 de 9h à 18 h afin de vous apporter de plus amples informations concernant ce programme. C’est avec un immense plaisir que nous vous recevrons, vous ainsi que toute personne qui désirera vous accompagner à cette date. 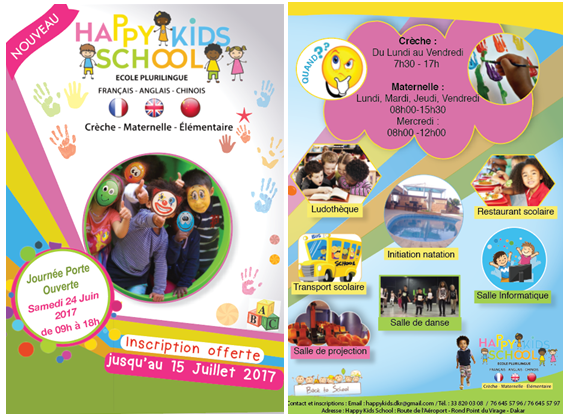 Happy Kids School, the first plurilingual school in Dakar (French, English and initiation to Chinese) gets a new look: New teaching programs, New teaching methods and improved layout of our premises. Therefore, we offer you an open house on Saturday, June 24, 2017 from 9 am to 6 pm to give you more information about this program. It is with great pleasure that we will receive you, as well as any person who wishes to accompany you on this date.